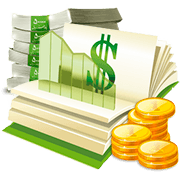 When it comes to eCheques, online casinos often allow them to be used to make deposits and withdrawals. Online gamblers generally prefer to use them for withdrawals though, as most players don’t want to wait for the payment to be processed before they can enjoy their favourite games. While the method does take longer than most other payment methods, the fantastic security – which we’ll tell you about later in this page – still makes this an extremely popular banking method. If you want to deposit using an eCheque, you’ll need to first fill in a form, detailing your bank details, as well as the amount of money you want to deposit. This form is then sent to the casino, who will process the payment. It usually takes at least a couple of days for the payment to be processed, and you’ll be notified when the funds are available to spend. But what about withdrawing using an eCheque? Well, as with depositing, it will take a few days for any withdrawal to take place, as the casino needs to process the payment, and the eCheque then needs to be cleared. The process is carried out by visiting the banking section of your chosen online casino – just follow the instructions listed under that withdrawal option. There is one reason above all others why New Zealanders choose to play at real money online casinos using an eCheque – security. There aren’t many other methods that can match the security of eCheques, as the only organizations that will know your bank details are the casino and your bank – there is no middleman to concern yourself with, as is the case with methods such as Neteller and Skrill. What’s more, eCheques often have state-of-the-art security features attached to them, including digital fingerprints. Along with Paysafecard, this really is the safest way to add and withdraw funds at an online casino. While the speed of transactions is slower than many other banking methods, don’t think that they are as slow as traditional cheques. While depositing or withdrawing using traditional cheques can take weeks – or even months – at an online casino eCheque transactions are generally processed within a few days. Sure, it might be slightly annoying having to wait a few days for your cash, but it could certainly be a lot worse! Double check that you’ve entered the correct information though, as not doing so can add considerable delays to the processing of the payment. Another massive advantage to eCheques is this: there are not usually any fees to pay. This is because the fees are levied on the online casino, and not on you, the customer. Some casinos will try to pass these fees on to you, however we certainly won’t be recommending any online casinos that do this. After all, why should you pay for the privilege of simply depositing or withdrawing funds? Do you want to deposit and withdraw using an eCheque? If so, there are plenty of options open to you. While some will have to test out loads of casinos before they find the perfect one, you’re in a fortunate position, as you’ll be able to head to your perfect online casino straightaway. Why? Because our reviews will tell you everything you need to know about a specific site, meaning you’ll be playing at a top site within minutes. So, why not read through our reviews of the top eCheque casinos today, and head to the one that is best for you? You should get a fantastic bonus when you do, as we only ever recommend casinos that offer the biggest and best bonuses! Don’t forget to also check back regularly, as our top sites are changing all the time, in order to reflect the current offerings of the various online casinos in NZ. eCheques are the same as standard cheques, as they’re a legal document that instructs a bank to pay a certain sum of money to the recipient. 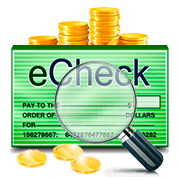 Unlike standard cheques though, eCheques are completely electronic, and they therefore offer much faster payments. They aren’t the most popular payment method at online casinos, however many still use them to add and withdraw funds. The security offered by eCheques is the main reason why people in New Zealand choose to use them, as your personal details are completely secure when you use this method. What’s more, eCheques often have state-of-the-art security features attached to them, including digital fingerprint technology. How do I use this payment method? If you want to deposit using an eCheque, you’ll need to fill in a form instructing your bank to make a payment to the online casino, which you then deliver to the casino. After the request has been processed, the money will be available. For withdrawals, head to the banking section of a casino, then simply follow the on-screen instructions. Is it free to use eCheques? Yes, it is completely free to use eCheques, as the payment company will pass the costs onto the online casino, and not you. You should always double-check to ensure that the casino hasn’t then tried to pass the cost onto you though, in the form of fees for depositing or withdrawing. We’ll never recommend a site that does this. What’s the top site for eCheques? 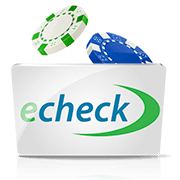 Most online casinos in NZ offer people the chance to withdraw using eCheque, while some also allow deposits to be made using this method. To find the casino that is best for you, you should read through the many reviews on this site. All have been written by experienced online gamblers, and all are also completely honest, as we’re not owned by any online casino.